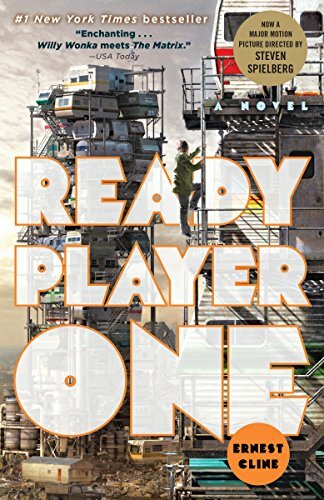 Ready Player One is a collection of all things good and creative: Harry Potter, Willy Wonka, Tron, The Matrix, Avatar . . . you get the idea. Screenwriter Ernest Cline is no stranger to geek-driven plots, evidenced by his cult favorite Fanboys, in which a group of rampant Star Wars fanatics plan a road trip to George Lucas’ Skywalker Ranch in order to steal the newly-minted Star Wars Episode I. Now, in his debut novel, Mr. Cline weaves a fascinating futuristic, semi-dystopian tale of our world 30 years in the future. Having continued its rapid decline, the Earth’s natural resources and food supplies are nearly depleted, habitable housing is in short supply, and the main form of employment and personal solace comes in the form of a virtual world video game called OASIS. OASIS was created by the Wonka-like reclusive genius James Halliday and his partner Ogdem Morrow, and is accessed via special virtual visor, gloves, and suites that allow for realistic graphics and full-immersion interaction. Now on the eve of his death and estranged from Marrow for the better part of a decade, Halliday lays down the gauntlet to millions of dedicated OASIS users world-wide: Find three keys (copper, jade and crystal) hidden among any of the 10,000 virtual worlds, which opens three corresponding gates that lead to one well-hidden electronic Easter egg. The keys can be found and the gates cleared by solving riddles and clues based on 1980s pop-culture. By possessing boundless knowledge and unparalleled skill as it relates to trivia of the decade and vintage, coin-operated video games, players have a chance at winning the grand prize: ownership of OASIS and Halliday’s multibillion dollar estate. Competing against the regular-Joes is the evil, Verizon-like conglomerate of IOI that provides the majority of internet connectivity for OASIS and is willing to literally kill for ownership of the Halliday empire in order to do what every large faceless corporation loves to do: commercialize and exploit, ultimately ruining it for everyone else. Wade Watts is one such regular Joe. Wade lives at below-poverty standards with his heartless aunt in “the stacks”—trailer homes stacked one on top of the other on girder-like platforms to allow for larger mass in a smaller area. Due to excessive bullying and brutality, Wade is attending his final year of high school online in OASIS. The search for the Easter egg has become known as the “Hunt” and the searchers as “gunters.” Though some choose to team up, many of the gunters prefer to remain solo in their search for the treasure—although they all have one common enemy: The Sixers. The Sixers are the thousands of gamers hired by IOI to search for the egg on the company’s behalf; and, they will stop at nothing—not even murder—to win. After five years with no results, the Hunt is tumbling in status, denigrated as a hoax—at least until Wade finds the first key. Now an overnight sensation and a target for IOI, Wade must trust his instincts and friends he has never met, to survive the game and ensure OASIS doesn’t fall into the wrong hands. One thing is for certain: Ernest Cline doesn’t pander to self-proclaimed pop-culture enthusiasts of the 80s. Though he lobs a few softballs in the form of mainstream movie quotes and popular song lyrics, he digs deep to create mind boggling puzzles and riddles that will stump even the most knowledgeable trivia expert—and definitely keep the reader guessing. Despite being a scriptwriter by trade, Mr. Cline’s voice comes off just a bit weak at times; but what he lacks in technicality, he more than makes up in creativity. Mr. Cline bestows on us one of the most lovable protagonists in geek history; Wade is sweet, smart, and unassuming, embodying everything an unlikely hero should: he’s caring, honest, sensitive, and oh so deserving. Wade Watts lives up to his Peter Parker superhero persona in spades. Ready Player One is an action-packed, highly entertaining, nostalgic thrill ride through the past combined with the danger and excitement of a not-too-distant future. It marries the fantastical world of Harry Potter with a touch of Orson Scott Card, where fantasy is reality, geeks are cool, and the possibilities are endless.